Teaching was disrupted on Thursday at a Glenmore school when educators were seen burning notices outside the gate. Parents who went to fetch their children after school said that they were “shocked” to see what was going on and they were told not to take their children to school the next day. She said on Monday, the learners received letters from the schools Head of Department (HOD) informing the parents that the school apologises for the inconvenience of having to keep the children at home on the Friday, however, the situation had been temporarily handled. “The letter said the disruptions were a result of a voice note which was incorrectly sent out, however, did not say what the voice note was about. It was still concerning to me that the school was not telling us parents what the situation was and saying it had been temporarily handled was not convincing,” said the parent. According to reports, again on Monday teaching and learning was stopped at the school by protesting leaders of the Simunye branch of the South African Democratic Teachers Union (SADTU), who allegedly demanded the Department of Education suspends the school principal for allegedly sexually abusing female educators. The principal is accused of summoning female educators to his office, forcing them to undress, then touching and kissing them. 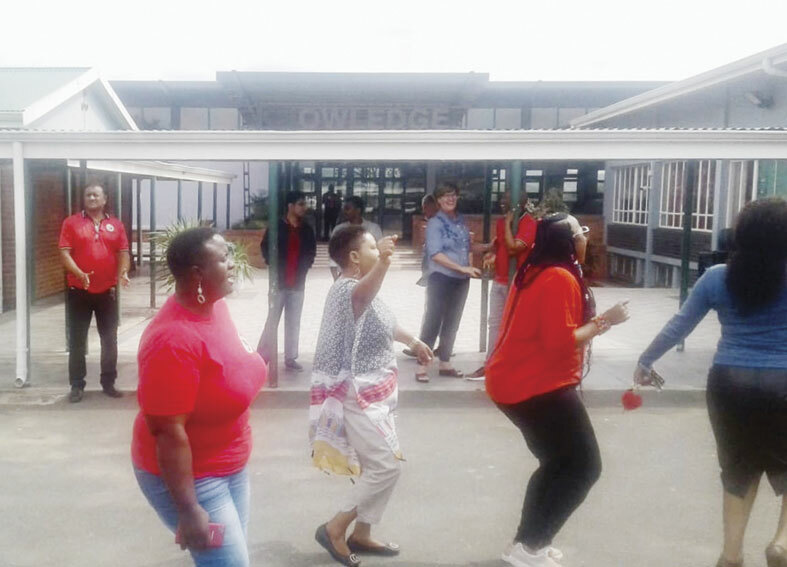 In a statement, Karabo Ramatholo of the Simunye branch said, “We only found out about the matter last Wednesday when one of the victimised educators forwarded us an audio clip describing everything that the principal is doing to them.” On Thursday, SADTU members demanded a meeting with the female staff at the school. While in the meeting with the educators, the principal told them he was diabetic and had to go out to get something to eat. “He has not returned to the school,” she said. Ramatholo said educators told them the principal would first show photos of other educators who had previously stripped for him. They said the abuse has been ongoing for several years. Educators had made anonymous reports to the district but nothing happened. “That is why we decided to act. We are going to follow through until we see justice,” said Ramatholo. The district official Themba Mthembu, who went to the school to address the protest, said MEC of Education Mthandeni Dlungwana had been notified. “The principal was supposed to be suspended before schools reopened last week. We are yet to investigate why it never happened,” said Mthembu. young and would be scared to speak out if he did anything to them. We want the department to really investigate deeper into the matter and make sure that none of the learners have been victims of the man,” said the parent. KZN MEC of Education Mthandeni Dlungwane visited the school on Tuesday. The principal was suspended and an acting principal was appointed. Department of Education spokesperson Kwazi Mthethwa said the principal of Carrington Heights Primary has been suspended pending investigations. “He is facing very serious allegations,” Mthethwa said. The department is also investigating verbal abuse claims by learners.